Background: Alcohol-induced hyperlipidemia is positively correlated with cardiovascular diseases. Several herbal extracts have been reported to protect the cardiac injury and suppress the hyperlipidemia. However, the effect of ginger extracts on alcohol-induced hyperlipidemia and associated myocardial damage remains unclear. Objective: This study investigated the cardio-protective properties of ginger ethanolic extract (Gt) against alcohol-induced myocardial damage, and further distinguished the association between hyperlipidemia and occurrence of myocardial damage in rats. Materials and Methods: Twenty four Wistar male albino rats (250 ± 20 g) were divided into four groups including, Normal control (NC) (0.9% NaCl), Ginger treated (Gt) (200 mg/Kg b.w. ), Alcohol treated (At) (20% of 6g/kg b.w. alcohol), and Alcohol along with Ginger treatment (At+Gt). In this study, lipid profiles such as fatty acids, triglycerides, total cholesterol, phospholipids, low density lipoprotein and high density lipoproteins, and cardiac biomarkers, including LDH, AST, CK-MB, cTn-T and cTn-I were examined in rats. Furthermore, histopathological studies were also conducted. Results: We found that alcohol-induced myocardial damage was associated with increased lipid profile except high density lipoprotein in alcohol treated (20%, 6g/kg b.w.) rats compared with control. Ginger treatment significantly reduced the alcohol-induced lipid profiles except high density lipoproteins. Furthermore, elevated cardiac biomarkers activity with alcohol intoxication was substantially suppressed by ginger treatment. In addition, ginger treatment for 7-weeks significantly minimized the alcohol-induced myocardial damage. Conclusion: Our results concluded that ginger could protect alcohol-induced myocardial damage by suppression of hyperlipidemia and cardiac biomarkers. Myocardial infarction (MI) is an acute condition of necrosis of the myocardium that occurs as a result of sudden or persistent interruption of blood supply to the demand of myocardium. Every year, worldwide more than 7 million people have been affected with MI. However, the occurrence of myocardial damage is mainly due to hyperlipidemia, loss of plasma membrane integrity and membrane peroxidation. Alcohol is one of the major risk factors for incidence of myocardial damage, and chronic alcohol consumption has been reported to have J or U shaped relationship with myocardial damage. Excessive chronic alcohol consumption altered the lipid homeostasis, which could be caused to the development of cardiovasculardisease. Alcohol consumption is independently and directly associated with circulating oxidized LDL, which triggered the vascular inflammation and progress the atherosclerosis. In addition, increased levels of LDL and decreased levels of HDL induced by chronic alcohol consumption, was mainly associated with myocardial damage., Alcohol also accounts for an additional increase of serum triglycerides with inhibition of free fatty acid oxidation. It is well established that increased lipid profiles and uncontrolled reactive oxygen species (ROS) production certainly cause tissue damage and release the cytosolic enzymes into plasma, such as Aspartate aminotransferase (AST), lactate dehydrogenase (LDH) and Creatine kinase (CK) along with increased Cardiac markercardiac troponin-T (cTn-T) levels., Therefore, control of lipid profiles elevation by antilipidemi substances could be a possible strategy to manage the occurrence of myocardial damage. Ginger (Zingiber officinalis Roscoe) belongs to the family of Zingiberaceae, and is cultivated in India and other parts of the World. From the ancient times, rhizomes of ginger have been consumed worldwide as a spice, flavouring agent and it is attributed with having many medicinal properties. The functional ingredients of ginger have shown many pharmacological properties, including cardio-protective, hepato-protective, anti-inflammatory, antioxidant, and antilipidemic property.,, Our previous studies confirm that ginger improved antioxidant status and attenuated oxidative damage against alcohol toxicity in liver and kidney of rats., However, there are only limited studies to demonstrate the protective effects of ginger extract on cardiac biomarkers and cytosolic enzymes in rats exposed to alcohol toxicity. Therefore, we proposed this study to investigate the effect of ethanolic extracts of ginger on alcohol-induced myocardial damage related to changes in cardiac biomarkers and lipid profiles. CK-MB, cTn-T and cTn-I Elisa kits were purchased from Bio Check, U.S.A. All the remaining chemicals were Analar Grade (AR) and obtained from the following scientific companies: Sigma (St. Louis, MO, USA), Fisher (Pittsburgh, PA, USA), and Merck (Mumbai, India). Ginger (Zingiber officinale Roscoe) rhizome was purchased from the local market in Tirupati, A.P. India. Ginger (voucher specimen No.1556) was authenticated by the professional Botanist, Dr. Madhava Chetty, Department of Botany, Sri Venkateswara University, Tirupati. Four kilograms of fresh ginger was cleaned, washed under running tap water, cut into small pieces, air dried and powdered. 200 g of this powder was macerated in 1000 ml of 99.9% ethanol for 48 hours at room temperature and then filtered. The filtrate was concentrated to dryness under reduced pressure in a rotary evaporator (Hahnshin, Model: HS-2005V, Korea). Twenty-four Wister strain male albino rats, weighing 250 ± 20 g, were obtained from the Indian Institute of Science, Bengaluru, India. The animals were housed in plastic cages and kept in the laboratory under constant temperature (27 ± 2°C) with 12 hrs dark and 12 hrs light for throughout treatment period. The rats received a standard pellet diet (Sai Durga feed, Bengaluru, India) and water ad libitum. The experiments were carried out in accordance with the guidelines and protocol approved by the Institutional Animal Ethics Committee as per resolution number (10 /i/a/CPCSEA/IAEC/SVU/KSR-GVS/dt 15/11/2010). The rats were divided into four groups each of six rats and the treatment was given every day via an orogastric tube for seven weeks. Group I: Normal Control (NC): rats received 0.9% saline and fed with normal diet. Group II: Ginger treatment (Gt): rats received 200 mg/kg of ethanol extract of ginger, orally, for seven weeks treatment (Dose was selected by doing dosage studies with 50, 100, 150, 200, 250 mg/kg b.w of ginger extract). 200 mg/kg b.w of ginger has been found more effective and safe dose. Group III: Alcohol treatment (At): rats received 20% alcohol at the dose of 6g/kg, orally, for seven weeks. Dose was selected by conducting the dosage-dependent studies with 2, 3, 4 and 6 g/kg body weight of 20% alcohol to induce myocardial infarction in rats. Alcohol at 6g/kg dose was found to be effective to induce MI. The required dose of alcohol (20%) in grams was calculated according to its density, and mixed with double distilled water (v/v) to get 20% solution. Group IV: Alcohol + Ginger treatment (At+Gt): rats received alcohol and ginger, as described in group II, III for a period of seven weeks. After completion of seven weeks treatment, the animals were sacrificed by cervical dislocation. Blood was collected from heart puncture and plasma was separated for cardiac biomarker estimation. Heart tissue was used for the histopathological studies and for biochemical assays. Lactate dehydrogenase (LDH) levels were measured in plasma using the commercially available kit. Briefly, reaction mixture contained 2.90 ml of 0.2 M tris buffer, 10 µl of plasma, 100 µl of 30 mM sodium pyruvate and 100 µl of NADH. The rate of oxidation of NADH was measured at 340 nm for 2 minutes in UV/VIS spectrophotometer. Aspartate transaminase (AST) levels were measured in plasma by the commercial available kits. Briefly, the reaction mixture in a total volume of 2 ml contained 100 µmoles of phosphate buffer, 40 µmoles L- aspartic acid, 2 µmoles α-ketoglutarate and 0.3 ml plasma. After incubation for 30 minutes at 37°C the reaction was arrested by adding 1ml of 0.00 1N 2-4 dinitrophenyl hydrazine. After 20 minutes, the absorbance was measured at 545 nm in UV/VIS spectrophotometer. Creatine kinase –MB (CK-MB) isoenzyme levels were measured in plasma using the commercial kit (Bio check Elisa kit, USA). The absorbance of the reaction mixture was measured at 340 nm for 3 minutes at 60s intervals. CK-MB levels are expressed as International Units per liter. Cardiac troponin -T (cTn-T) and Cardiac troponin- I (cTn-I) levels in plasma were estimated using commercially available kit (Biocheck Elisa kit, U.S.A). The absorbance of the reaction mixture was measured at 450nm in Bio-Rad iMark Microplate reader 10622, Japan. cTn-T and cTn-I levels were expressed as nano gram per mille liter. Plasma free fatty acids (FFAs) levels were estimated by the method of Falholt et al., and triglycerides (TGs), total cholesterol (TC) levels were measured by using commercial available kits (Merck India Ltd). Phospholipids (PLs) were estimated by the method of Zilversmit and Davis and high density lipoproteins (HDL) levels were estimated enzymatically by colorimetric kits (Merck India Ltd). Low density lipoproteins (LDL) were calculated as per the method of Friedewald et al. Cardiac tissues were fixed in 10% buffered formalin and embedded in paraffin. Serial sections (3 µm thick) were cut using microtome (Leica RM 2125, Germany). Each section was stained with haematoxylin and eosin (H and E). The sections were examined under a light microscope (Nikon, Tokyo, Japan). The pathologist performing histopathological evaluation was blinded to the treatment assignment of different study groups. Hearts were cut into pieces and fixed in 0.1 mol/L sodium phosphate buffer containing 2.5% glutaraldehyde for 3 h at 4°C, then osmicated in 1% osmium tetroxide for 1 h at 4°C. After dehydration of the tissues by using ethanol series, the samples were embedded in Epon 812 and sectioned using a Leica EM UC6 (Leica Coviema , Austria) ultra-microtome. Sections were viewed and photographed using a Hitachi 7650 TEM (Hitachi, Tokyo, Japan) at 80 kv. Statistical analysis was performed by SPSS software version 16.0 (SPSS Inc, Chicago, IL, USA). Dennett's multiple comparison post-hoc tests and one-way analysis of variance (ANOVA) were used to assess the significant differences. The data was represented as mean ± S.D. A value of P<0.05 was considered significant. Both LDH and AST are widely considered as blood biomarkers of tissue injury. As shown in [Figure 1] and [Figure 2], alcohol intoxication (6 g/kg) for 7 weeks, greatly (P<0.05) increased the release of LDH (198.98 ± 6.21 IU/L) and AST (220 ± 6.58 IU/L) levels into the blood stream. However, co-administration of ginger extract along with alcohol intake significantly suppressed the release of both LDH and AST into the blood. The suppressed LDH (92 ± 4.81 IU/L) and AST (171 ± 6.10 IU/L) levels with ginger plus alcohol treatment were almost similar to normal control values in this study. 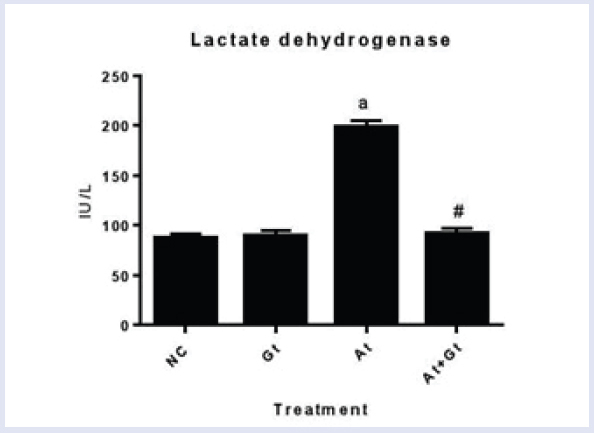 Figure 1: Effect of Ginger on Lactate dehydrogenase (LDH) levels in alcohol induced myocardial infarction (MI) rats. All values are expressed as mean ± SD values with six replicates. aP<0.05 normal control compared with alcohol treated group alone, #P<0.05 alcohol treated group compared with ginger treated alcoholic group. 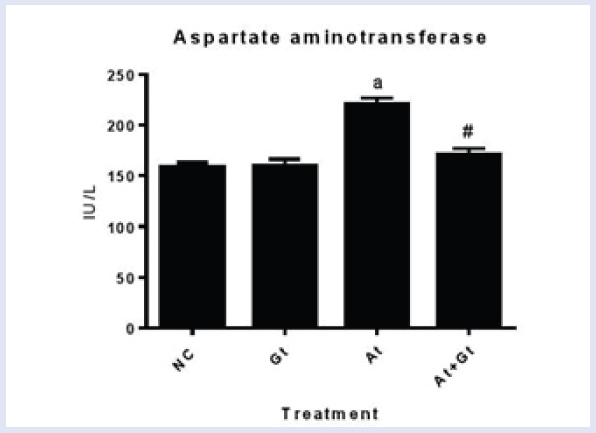 Figure 2: Effect of Ginger on Aspartate aminotransferase (AST) levels in alcohol induced myocardial infarction (MI) rats. All values are expressed as mean ± SD values with six replicates. aP<0.05 normal control compared with alcohol treated group alone, #P<0.05 alcohol treated group compared with ginger treated alcoholic group. To evaluate whether chronic alcohol intake could produce myocardial infarction in rats, in this study, we assayed the concentrations of CK-MB in plasma, which is a primary biomarker of MI. The results showed that alcohol consumption significantly increased the plasma CK-MB (155 ± 6.14 IU/L) levels, which was about 5-fold higher than the saline treated rats. Interestingly, ginger treatment significantly (P< 0.05) attenuated the alcohol-induced elevation of CK-MB (99 ± 6.6 IU/L) [Figure 3]. 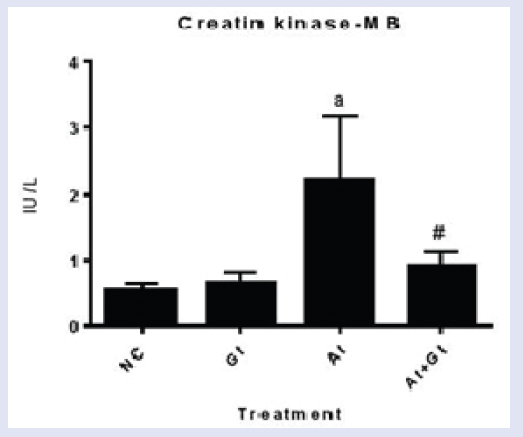 Figure 3: Effect of Ginger on Creatine kinase-MB (CK-MB) levels in alcohol induced myocardial infarction (MI) rats. All values are expressed as mean ± SD values with six replicates. aP<0.05 normal control compared with alcohol treated group alone, #P<0.05 alcohol treated group compared with ginger treated alcoholic group. Then, we examined the changes in key troponin family proteins, cTn-T and cTn-I that are highly specific for MI. The data was presented in [Figure 4]A-B. Similar to CK-MB response, we found several folds increase of cTn-T ( 2.212 ± 1.23 ng/ml) and cTn-I (3.735 ± 1.320 ng/ml) concentrations in the plasma of alcohol fed rats (P< 0.05). Nevertheless, this elevation was found to decrease cTn-T (0.823 ± 0.142 ng/ml) and cTn-I (0.947 ± 0.203 ng/ml) in ginger treated alcoholic rats, which implies that the ginger protective effects are observed against alcohol-induced rise in both cardiac biomarkers.Despite, ginger alone treatment at given dose didn't affect the cTn-T and cTn-I levels in the plasma. Figure 4: A: Effect of Ginger on cardiac troponin-T (cTn-T) levels in alcohol induced myocardial infarction (MI) rats. All values are expressed as mean ± SD values with six replicates. aP<0.05 normal control compared with alcohol treated group alone, #P<0.05 alcohol treated group compared with ginger treated alcoholic group. B: Effect of Ginger on cardiac troponin-I (cTn-I) levels in alcohol induced myocardial infarction (MI) rats. All values are expressed as mean ± SD values with six replicates. aP<0.05 normal control compared with alcohol treated group alone, #P<0.05 alcohol treated group compared with ginger treated alcoholic group. Hyperlipidemia characterized by elevated levels of cholesterol and triglycerides is a hallmark of myocardial infarction. Therefore, we monitored the changes in lipid profiles in alcohol and ginger treated rats to emphasize the ginger protective role as cardio-protective substance. As presented in [Table 1], the estimated FFA, TG, PL, TC and LDL concentrations were dramatically increased, while HDL levels were significantly decreased in the plasma of alcohol intoxicated rats (P< 0.05). However, all these adverse changes in lipid profiles were substantially attenuated with ginger extract administration for 7 weeks. The profound antilipidemic activity of ginger extract may contribute to ameliorating the alcohol-induced architectural damage of cardiac tissue of rats. Table 1: Effect of Ginger on lipid profiles in alcohol induced myocardial infarction rats. All values are expressed as mean ± SD values with six replicates. aP<0.05 normal control compared with alcohol treated group alone, #P<0.05 alcohol treated group compared with ginger treated alcoholic group. Since ginger treatment reported to suppress the biomarkers of MI and attenuated the hyperlipidemia against alcohol intoxication, we extended our studies to evaluate the role of ginger extract on the alcohol-induced myocardial injury in rats. The Transmission electron microscopic and light microscopic studies [Figure 5]c [Figure 6]a clearly demonstrated that alcohol-induced formation of thrombosis in coronary vessels, necrosis of cardiac cells, haemorrhages and collapsed myocardial fibbers. This cardio-protective property of ginger was evidenced by a lessening of architectural damage, recovery of the nucleus, regeneration of myofibrils, and recovery of the intercalating disk [Figure 5]d and [Figure 6]b. We further found that scattered nucleus with alcohol intoxication, which is a key step in the progression of MI was found to be normal in ginger combined alcoholic rats. Figure 5: A: Light microscopic of normal control (NC) rats heart showing: 1. Normal Myofibril 2. Normal intercalated disks 3. Normal Nucleus B: Ginger treatment (Gt) 1. Mild degeneration of intercalated disks 2. Mild changes of myofibril structure C: Alcohol treatment (At) 1. Hemorrhages 2. Necrotic changes 3. Collapsed Myocardial Fibers D: Alcohol + Ginger treated (At+Gt) 1. Recovery of Intercalate disc 2. Regeneration of nucleus 3. Recovery of myofibril structure. Figure 6: A: Electron microscopic of alcohol treatment (At) rats heart showing 1. Thrombosis formation in coronary vessel 2. Coronary vessel 3. Necrosis of cardiac cells B: Alcohol +Ginger treated (At+Gt) 1. Recovery of nucleus 2. Regenaration of myofibril structure. Alterations in lipid metabolism and cell membrane integrity are the major concerns in the occurrence of alcohol-induced cardiac tissue injury or myocardial infarction. Statistical data showed that myocardial damage is increasingly contributing to alcohol related mortality. 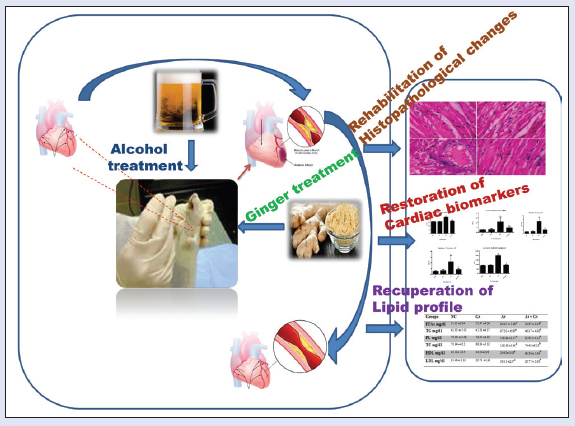 In this study, we demonstrated that treatment of ginger extracts to alcohol fed rats remarkably alleviated the progression of chronic alcohol-induced cardiac injury. This was evidenced by a lessening of myocardial architectural damage, including recovery of the nucleus, regeneration of myofibrils, and recovery of intercalating disk in ginger treated alcoholic rats. The cardio-protective effects of ginger were associated with attenuation of hyperlipidemia, suppression of tissue injury markers release (LDH and AST), and inhibition of myocardial damage biomarkers against alcohol-induced elevation. All these tissue protective signs could contribute to attenuate the incidence of myocardial damage in alcohol fed rats. It is well-known that dyslipidaemia is one of the major risk factors in the development of cardiovascular disease. Previous studies demonstrated that chronic alcohol consumption could increase the lipolytic activity and elevate FFAs concentration in the plasma. The increased FFAs with alcohol intake may increase the circulating TG concentrations, which may be due to enhanced phosphatide phosphohydrolase activity. Both elevated FFAs and TG concentrations in rats have been shown to produce myocardial infarction under isoproterenol-induced toxic conditions. Similar consequences were found in our study that uncontrolled FFAs and TG levels with alcohol intoxication was followed by an elevation of cardiac biomarkers and myocardial injury. Interestingly ginger treatment (200 mg/kg b.w.) for 7 consecutive weeks along with alcohol feeding substantially decreased the FFAs and TG concentrations. This data implies that ginger extract could alleviate the myocardial injury partially due to the suppression of circulating FFAs and TG levels. Irrespective of its cardio-protective properties, ginger extract has been reported to decrease FFAs and TG levels in rats with metabolic syndrome and diabetes. Thus, the ginger extract consumption could result in accumulation of active ingredients within the cells, as well as in the cell plasma membrane receptorsmay reduce the plasma TG by increasing pancreatic lipase and amylase, which inhibit lipid hydrolyse in intestinal tract, reducing lipid peroxidase. Further, the results from our study convinced that increased circulating cholesterol, LDL and phospholipids with alcohol intake were substantially suppressed by ginger treatment. Increased phospholipids in plasma imply the peroxidation of unsaturated membrane lipids in bio-membranes and tissues causing leakage of lipids into circulation. This phenomena have been reported in the previous studies, which demonstrated that incidence of myocardial damage was associated with increase of phospholipids in plasma. In addition to that, increased phospholipids induce free fatty acids in plasma due to escalation of phospholipase A2 activity in cardiac tissue., In our results, similar consequences were observed in alcohol fed rats. Previous studies indicated that elevated cholesterol and LDL levels were accompanied by increased cardiac tissue damage in rats. High amount of cholesterol released into plasma may associate with increased cholesterol biosynthesis, decreasing cholesterol ester hydrolysis and reducing cholesterol efflux accompanied to free radicals over production in stress condition. Accumulation of ester cholesterol occurs when the rate of esterification increases by cholesterol ester synthetase in myocardial membrane damage. In addition to this, impaired LDL and HDL ratio also found to be correlated with the development of MI., On the other hand, ROS plays a main role in promoting oxidation of low density lipoproteins. Oxidation of LDL in the presence of low levels of HDL mainly contribute to induce myocardial damage. In view of these reports, maintaining of high levels of HDL cholesterol and/or prevention of LDL oxidation could be the main strategies to restrict the progression of myocardial damage. Therefore, ginger-mediated reduction of total cholesterol, LDL and phospholipids, and concurrent increase of HDL concentrations in alcohol-fed rats implies that ginger could primarily contribute to lowering the hyperlipidemia. We assume that this phenomenon, which was observed from our study may lead to ameliorate the alcohol-induced myocardial infarction. A study by Fuhrman and colleagues (2000) demonstrated that dietary intake of ginger is capable of reducing the development of atherosclerosis by decreasing the plasma LDL and cholesterol in apolipoprotein E-deficient mice. This study further indicated that ginger extract consumption reduces the cellular uptake of oxidized LDL, possibly due to steric modification of plasmalipoprotein receptors. Besides, ginger ethanolic extract is shown to reduce the hyperlipidemia, which may be due to the increased activity of cholesterol-7-alpha hydroxylase that initiate the conversion of cholesterol to bile acids. The cytosolic enzymes, LDH and AST emerge mostly from all tissues, including liver, kidney and heart; and enormously released into the circulation of blood followed by tissue injury. In the present study, both LDH and AST concentrations were significantly increased upon alcohol intoxication. Elevated cytosolic enzymes reveal the ability of alcohol to interact with membrane proteins, which then lead to the modification of cell membrane integrity thereby release into circulation. Increased myocardial damage in alcohol intoxicated rats seemed to be the elevation of serum LDH and AST concentration. Consistent with its anti-hyperlipidemic activity, ginger combination treatment suppressed the release of both LDH and AST. It is well documented that alcohol-induced excessive ROS eventually attack the cell membrane and destructively damage cellular architecture. In this scenario, the potential antioxidant property of ginger may eliminate the excessive ROS, thereby prevent the tissue damage. Although we didn't measure antioxidant biomarkers in this particular study, our previous studies convinced the tissue protective effects of ginger through its antioxidant activity., Previous studies support our findings that tissue protective efficacies of ginger could be reasoned by reducing the circulating LDH and AST levels in rodents under oxidative stress conditions. Another important finding of this study is that alcohol-induced the increase in cardiac damage biomarkers CK-MB, cTn-T and cTn-I, and was remarkably suppressed by ginger treatment. Elevated levels of CK-MB, cTn-T and cTn-I could be due to the increased generation of free radicals during alcohol metabolism. Those highly unstable alcohol metabolites and free radicals may increase the calcium mediated proteases activity that could damage the cellular proteins and release cytosolic enzymes into the serum., The reports are available on the 6-Gingerol antioxidant activity which proven that potentially ameliorate the cardiac damage via reducing the free radical mediated lipid peroxidation and release of cytosolic enzymes from cardiac tissue., Another major previous evidence supported to our study on ginger cardio protective activity is that ginger showed cardiac protection in isoproterenol induced myocardial infarction through attenuation of the release of cardiac biomarkers in serum. Therefore, ginger retarded the cardiac biomarkers levels in plasma under ethanol intoxication, which may be in consequence of ginger protection against lipid peroxidative stabilization of cardiac membranes, and prevent leakage of cardiac cytosolic enzymes via their hypolipidemic and antioxidant activity. To provide additional convincing evidence on ginger cardio-protective effects, we performed histopathological studies by using transmission electron microscopy and light microscopy. First we identified the alcohol-induced myocardial damage as images illustrated with collapsed myocardial fibers, thrombosis in coronary vessels, haemorrhages, and cardiac cell necrosis. These pathological signs confirmed the successful development of myocardial damage rat model at the given dose of alcohol. Alcohol-induced myocardial damage in this study, at least in part, is due to the accumulation of free fatty acids, elevation of triglycerides, and malfunction of lipid profiles. Our findings were supported by previous studies, who reported strong positive correlation between myocardial damage and hyperlipidaemia. These drastic changes were rehabilitated in cardiac tissue by ginger treatment, may be, by acting as a good antioxidant and/orhypolipidemic substance. Collectively, our findings confirm hypothesis that ginger has cardioprotective potential. Ginger treatment reduced the myocardial damage likely due to the detoxification of alcohol through suppression of hyperlipidemia, preserving the tissue damage bio markers LDH, AST and cardiac biomarkers CK-MB, cTn-I and cTn-T levels in plasma. Preservation of histoarchitecture of myocytes by ginger treatment reconfirms these effects. Complementary studies are needed to explore other possible mechanisms by which ginger acts on the myocardial damage to beneficially affect cardiovascular system. The authors acknowledge the University Grants Commission (UGC), New Delhi, for financial support in the form of Major Research Project awarded to the corresponding author F. No. 43-586/2014(SR) dated 13-10-2015 and UGC-BSR One time Grant (Ref. No. F-19-141/2014 (BSR) dated 16-12-2014). Whellan DJ. Heart failure disease management: implementation and outcomes. Cardiol Rev 2005;13:231-39. White HD, Chew DP. "Acute myocardial infarction". Lancet 2008;372:570-84. Krushna G, Kareem MA, Devi KL. Anti-dyslipidaemic effect of Aegle marmelos Linn. fruit on isoproterenol induced myocardial injury in rats. Int J Pharmacol 2009;6:1-5. Reynolds K, Lewis B, Nolen JD, Kinney GL, Sathya B, He J. Alcohol consumption and risk of stroke: a meta-analysis. JAMA 2003;289:579-88. Walldius G, Jungner I. The apoB/apoA-I ratio: a Strong, new risk factors for cardiovascular disease and target for lipid-lowering therapy: a review of the evidence. J Intern Med 2006;259:493-519. Schroder H, Marrugat J, Fito M, Weinbrenner T. Covas MI Alcohol consumption is directly associated with circulating oxidised low-density lipoprotein. Free Radic Biol Med 2006;40:1474-81. Gaziano JM, Buring JE, Breslow JL, Goldhaber SZ, Rosner B, Van Denburgh M. Moderate alcohol intake, increased levels of high-density lipoprotein and its subfractions, and decreased risk of myocardial infarction. N Engl J Med 1993;329:1829-34. Savolainen MJ, Kesäniemi YA. Effects of alcohol on lipoproteins in relation to coronary heart disease. Curr Opin Lipidol 1995;6:243-50. Hidiroglou N, Madere R. Effect of chronic ethanol dosing on hepatic triglyceride and phospholipid profile and fatty acids in the guinea pig. Alcohol 1999;19:229-33. Balasubramaniyan V, Nalini N. Effect of leptin on peroxidation and antioxidant defense in ethanol-supplemented Mus musculus heart. Fundam Clin Pharmaco 2007;21:245-53. Saravanan R, Pugalendi V. Impact of ursolic acid on chronic ethanol-induced oxidative stress in the rat heart. Pharmacol Rep 2006;58:41-7. Dugasani S, Pichika MR, Nadarajah VD, Balijepalli MK, Tandra S, Korlakunta JN. Comparative antioxidant and anti-inflammatory effectsof -gingerol, -gingerol, -gingerol and -shogaol. J Ethnopharmacol 2010;127:515-20. Shanmugam KR, Mallikarjuna K, Sathyavelu Reddy K. Efficacy of ethanolic extract of ginger on kidney lipid metabolic profiles in diabetic rats. Int J Diabetes Dev Ctries 2011;31:97-103. Ansari MN, Bhandari U, Pillai KK. Ethanolic Zingiber officinale R extract pre-treatment alleviates isoproterenol-induced oxidative myocardial necrosis in rats. I J Expl Bio 2006; 44:892-7. Mallikarjuna K, Sahitya Chetan P, Sathyavelu Reddy K, Rajendra W. Ethanol toxicity: Rehabilitation of hepatic antioxidant defense system with dietary ginger. Fitoterapia 2008;79:174-8. Shanmugam KR, Ramakrishna CH, Mallikarjuna K, Sathyavelu Reddy K. Protective effect of ginger against alcohol- induced renal damage and antioxidant enzymes in male albino rats. Indian J Exp Biol 2010;48:143-9. Falholt K, Lund B, Falholt W. An easy colorimetric method for routine determination of free fatty acids in plasma. Clin chim Acta 1973;46:105-11. Zilversmit DB, Davis AK. Micro determination of plasma phospholipids by trichloroacetic acid precipitation. J Lab Clin Med 1950;35:155-60. Friedewald WT, Levy RI, Fredrickson DS. Estimation of concentration of low density lipoprotein cholesterol in plasma without use of the preparative ultracentrifuge. Clin Chem 1972;18:499-502. Poss J, Custodis F, Werner C, Weingärtner O, Böhm M, Laufs U. Cardiovascular disease and dyslipidemia: beyond LDL. Curr Pharm Des 2011;17:861-70. Drago S. Study of lipid profile in chronic alcoholics. The Indian practitioner 2002;55:5-8. 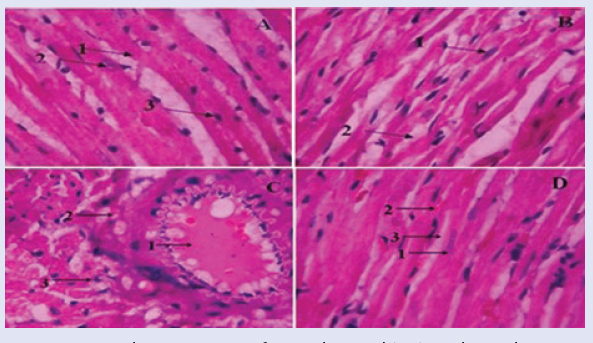 Prince PSM, Selvaraju S, Periyathambi TD, Muthukumarasamy V. Cardio protective effect of 'Marutham' a polyherbal formulation on isoprotrenol induced myocardial infarction in Wistar rats. Fitoterapia 2008;79:433-8. Nammi S, Satyanarayana S, Roufogali BD. Protective Effects of Ethanolic Extract of Zingiber officinale Rhizome on the Development of Metabolic Syndrome in High-Fat Diet-Fed Rats. Basic Clin Pharmacol Toxicol 2009;104:366-73. Platel K, Srinivasan K. Influence of dietary spices and their active principles on pancreatic digestive enzymes in albino rats. Nahrung 2000;44:42-6. Han LK, Gong XJ, Kawano S, Saito M, Kimura Y, Okuda H. Antiobesity actions of Zingiber officinale Roscoe. Yakugaku Zasshi 2005;125:213-7. Liu N, Huo G, Zhang L, Zhang Y. Effect of Zingiber officinal Rose on lipid peroxidation in hyperlipidemia rats. Wei Shang Yan Jiu 2003;32:22-3. Sathish V, Ebenazer KK, Devak T. Synergistic effect of nicorandil and amlodipine on tissue defense system during experimental myocardial infarction in rats. Mol Cell Biochem 2003;243:133-8. Chien KR, Sharman SC, Mittnacht Jr S, Farber JL. Microsomal membrane structure and function subsequent to calcium activation of an endogenous phospholipase. Arch Biochem Biophy 1980;205:614-22. Upaganlawar AB, Balaraman R. Cardio protective effect of vitamin E in combination with lycopene on lipid profile, lipid metabolizing enzymes and infarction size in myocardial infarction induced by isoproterenol. Pharmacologia 2012;3:215-20. Gesquiere L, Loreau N, Minnich J, Davignon J, Blache D. Oxidative stress leads to cholesterol accumulation in vascular smooth muscle cells. Free Radic Biol Med 1999;27:134-45. Upaganlawar A, Balaraman R. Effect of vitamin E and green tea on hemodynail electro cardiographic and some biochemical alterations in experimentally induced myocardial infarction in rats. Eur J Int Med 2010;2:135-41. Vennila L, Pugalendi KV. Efficacy of sesamol on plasma and tissue lipids in isoproterenol-induced cardiotoxicity in wistar rats. Arch Pharma Res 2012;8:1465-70. Radhiga T, Rajamanickam C, Senthil S, Viswanathan Pugalendi K. Effect of ursolic acid on cardiac marker enzymes, lipid profile and macroscopic enzyme mapping assay in isoproterenol-induced myocardial ischemic rats. Food chem toxicol 2012;50:3971-7. Heinecke JW, Suits AG, Aviram M, Chait A. Phagocytosis of lipase-aggregated low density lipoprotein promotes macrophage foam cell formation Sequential morphological and biochemical events. Arterioscler Thromb 1991;11:1643-51. Fuhrman B, Rosenblat M, Hayek T, Coleman R, Aviram M. Ginger extract consumption reduces plasma cholesterol, inhibits LDL oxidation and attenuates development of atherosclerosis in atherosclerotic, apolipoprotein E-deficient mice. J Nutr 2000;130:1124-31. Bhandari U, Kanojia R, Pillai KK. Effect of ethanolic extract of Zingiber officinale on dyslipidaemia in diabetic rats. J Ethnopharmacol 2005;97:227-30. Kanan M, Wang L, Kang YJ. Myocardial oxidative stress and toxicity induced by acute ethanol exposure in mice. Exp Biol Med 2004;229:553-59. Lindros KO. Alcoholic liver disease: Pathobiological aspect. J Hepatol 1995;23:7-15. Helal EGE, El-Wahab SMA, Sharaf AMM, Zedan GA. Effect of Zingiber officinale on fatty liver induced by oxytetracycline in albino rats. Egyptian J Hospital Med 2012;46:26-42. Patel VB, Ajmal R, Sherwood RA, Sullivan A, Richardson PJ, Preedy VR. Cardio protective effect of propranolol from alcohol-induced heart muscle damage as assessed by plasma cardiac troponin-T. Alcohol Clin Exp Res 2001;25:882-9. Ren J, Wold LE. Mechanisms of alcoholic heart disease. Ther Adv Cardiovasc Dis 2008;2:497-506. Mansour A, Bakheet SA, Aleisa AM, Al-Rejaie SS, AL-Yahya AA, ElAmeen M, et al. Protective Effect of 6-Gingerol Against cardiotoxicity Induced by Doxorubicin. Open Pharmacol J 2008;2:20-3. Attyah AM, Ismail SH. Protective Effect of Ginger Extract Against Cisplatin-Induced Hepatotoxicity and Cardiotoxicity in Rats. Iraqi J Pharm Sci 2012;21:27-33. Al-AZhary DB. Ginger enhance antioxidant activity and attenuates atherogenesis in diabetic cholesterol-fed rats. Aust J Basic Applied Sci 2011;5:2150-58.